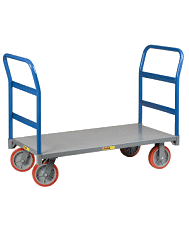 Wesco Aluminum Tread Plate Platform Carts - Commercial models! Design your own Aluminum Platform Cart. This Aluminum Platform Cart comes in 4 different sizes, and caster options. Great for indoor or outdoor use (with the pneumatic tires). It's the perfect choice for your warehouse, business, or office. Comes standard with 1 handle, but you can also upgrade to two handles.